America's first swept-wing jet fighter, the F-86 Sabre. Panoramic view inside the North American F-86A Sabre. America's first swept-wing jet fighter, the F-86 Sabre joined the ranks of great fighter aircraft during combat operations high above the Yalu River in Korea. Even though they could not pursue the enemy across the Chinese border, Sabre pilots established an impressive shoot-down advantage against enemy MiGs. Sabre designers capitalized on captured German aerodynamic data, which showed that swept wings delayed air compressibility effects encountered at high subsonic airspeeds. Swept-wing aircraft could therefore be controlled at much higher speeds than similar straight-wing aircraft. This F-86A saw combat against MiG-15s during the Korean War. It flew most of its missions from Kimpo Air Base near Seoul and bears the markings of the 4th Fighter Wing, the first F-86 unit in Korea. The F-86 Sabre joined the ranks of the great fighter aircraft during combat operations high above the Yalu River area of Korea. Although the enemy MiG-15s could not be pursued across the Chinese border, the American Sabre pilots established a victory ratio of more than ten to one. available to the North American designers with the surrender of Germany in May 1945. These data indicated that a swept wing delayed the compressibility effects encountered at high subsonic speeds. Swept winged aircraft could be controlled at a considerably higher Mach number (percentage of the speed of sound) than a straight winged aircraft of the same general configuration. The swept wing, however, introduced low-speed stability problems. After scale model wind tunnel tests, the designers selected a wing that was swept back at an angle of 35 degrees, and added automatic leading edge slats to solve the stability problem. The first XP-86 flew on October 1, 1947, powered by an Allison J35-C-3, a 3,750 lb. thrust engine. In April 1948, the XP-86 exceeded Mach 1 (the speed of sound) in a shallow dive. On December 28, 1947, the Air Force ordered 221 P86As to be powered by the 4,850 lb. thrust General Electric J47-GE-1 engine. In June 1948, a month after the first P-86A flight, its designation was changed to F-86A. On September 15, 1948, an F-86A set a world speed record of 671 mph. In addition to its high performance, the F-86A had excellent handling characteristics and was well liked by its pilots. The Sabre was armed with six .50-caliber M3 machine guns mounted in the nose. The Mark 18 manual-ranging computing gun sight was replaced in later models with the A-1CM, which used radar ranging. In December 1950, the 4th Fighter Interceptor Wing, one of the first of the Air Force's Sabre units, arrived in Seoul to fight the Russian-built sweptwing MiG-15s, which had appeared in Korea in November. On December 17, in the first known combat between sweptwing fighters, Lt. Col. Bruce H. Hinton shot down a MiG-15s. By the end of the Korean War, the Sabres had destroyed almost 800 MiG-15s with the loss of fewer than eighty F-86s. The F-86 progressed through several improved versions-the F-86E, F, H, D. and K models. The changes, in most cases, included improved armament, more powerful engines, and control-system modifications. The F-86D, however, was an all-weather interceptor with a radar nose, and was armed with rockets instead of machine guns. The F-86K was a D-model with 20-mm machine guns replacing the rockets. In addition to those produced in California and Ohio, F-86s were built under license in Canada, Japan, and Italy. Of the 8,443 Sabres produced, 554 were F-86As. 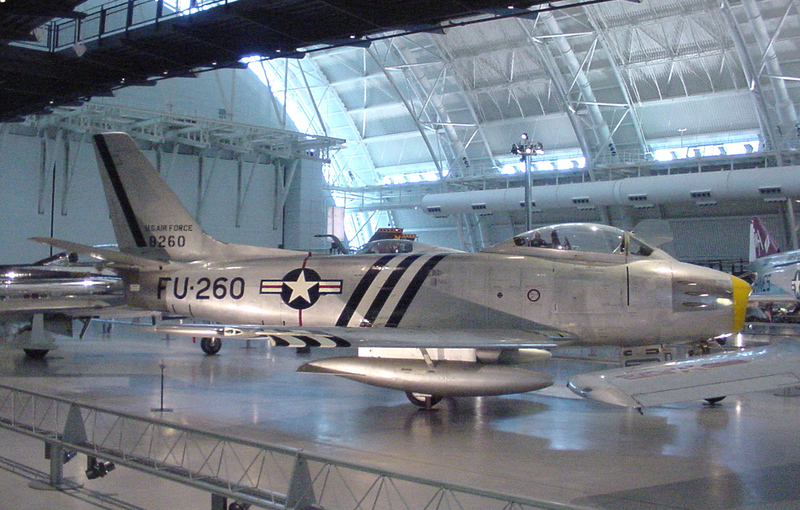 The National Air and Space Museum's F-86A was assigned to the 4th Fighter Interceptor Group at Langley Air Force Base, Virginia, in July 1949. It was shipped to Japan in December 1950 with other F-86s of the 4th Group, and flown in Korea. Most of its combat missions against Mig-15s were flown from Kimpo Air Base near Seoul. It is displayed in the markings of the 4th Fighter Wing, the first F-86 unit in Korea. These markings were in use before June 1952. All-metal structure with flush-riveted, stressed skin; natural metal finish. America's first operational swept-wing fighter (35 degrees); single-engine, single-seat, low-wing catilever monoplane, jet fighter.